A warm “G’day” from St Mary’s Parish. We would like to invite you and your child to continue on the faith journey started at your child’s baptism, by participating in our preparation program for the sacrament of First Eucharist. We are organising this program for baptised Catholic children who are in at least year 3 at school. That said, you know your child and your family’s circumstances much better than we do, so please feel free to wait another year or two if that suits you better. 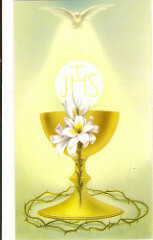 The sacrament itself will be celebrated in St Mary’s Church on Sunday 23rd June at 8:30am. If you have any queries/concerns, please do not hesitate to call me (Fr Peter) on 0407 914 341.